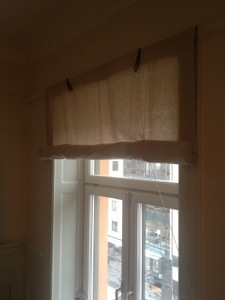 Make your own Swedish roller blind! Made these for the sitting room, and they were actually easy-ish to make… The style was popular in Swedish homes from the 18th century, and I think they suit my mix of old and new. -2 leather straps and curtain rings that fit onto them (they would have been glass originally, but metal ones would look nice. I only had plastic but that still looks fine). 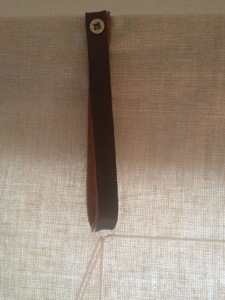 -string (the strong, thin kind used for roman blinds). 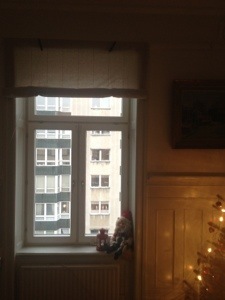 Measure the height of the window and multiply it by 6 to give you an idea of how long it needs to be. -Hem the side edges of the fabric, remembering to fold in the raw edge of the fabric as the back will show when the blind is rolled up. No need to hem top and bottom. 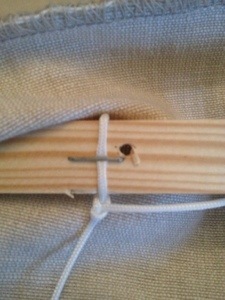 -Roll a little of the bottom of the fabric onto the round timber piece and staple in place. -Now make two holes in the timber you are using at the top to help you later when you are attaching the blind to your window frame. The holes should be where you want your string, about a quarter of the distance from the edges. Tie the edge of the string around the timber close to the hole. Do this for both sides and secure with a staple. Fold the fabric over the top of the timber, and either secure it with staples (if you are not going to want to wash the curtains very often), or just a couple of invisible pins like I did. 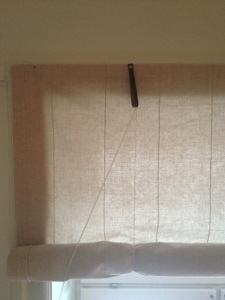 Securing them only with pins had the added benefit of being easy to adjust when you fix the blind to the wall. Remember, if you accidentally don’t have a perfect 90 degree angle at the top corners the blind will be wonky, but that is easy to adjust if you have a nice patient helper to hold it up whilst you adjust the pins (a miserable husband will do to). -Thread the ring onto the leather straps, if you make them a bit shorter than mine they shouldn’t pull towards the middle so much. By the way I punched holes in the leather to help the screw go through. Now attach to the window frame or wall, checking that everything is nice and straight. -Thread the string. Starting from the back at the top where you tied it, running down, up the front, through the ring (and through the other ring for the far side) and down to the cleat. -First few times you will need to help it along to roll tightly, but it will be easier when the fabric “gets used to it”. Thanks:) I didn’t use backing/lining, but I did make really wide side hems which came out quite nice. 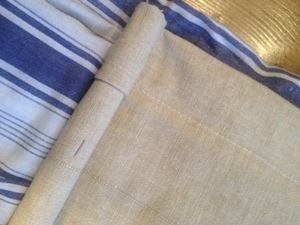 Also the fabric I used came from some old ikea curtains and they have thicker threads going through like stripes.